There is a media-led belief that violent activities such as knife crime is on the increase in the UK. This is despite the fact that figures given by the government on violent crimes were reassuringly on the decrease between 1995 and 2005. The decrease in the rates reported was attributed to a reduction in the number of domestic violence. However, some series have reported an increase in deliberate penetrating injury in the younger population. This belief is further supported by several studies done in other countries such as Israel,  Jamaica,  Zambia  and Australia. , It is reported that around 1200 knife crimes took place in London in 2005. Despite these alarming statistics, recent hospital admission with stab injuries since 2005 is lacking in the literature. In addition, Licensing Laws 2003 was introduced in November 2005 which permitted 24-hour drinking under English and Welsh law. Data assessing the impact of relaxing alcohol consumption on the pattern of violence is limited. As a result, a study assessing recent trends in stab injuries would be highly beneficial. Our hospital is based in a deprived inner-city area of London where a high volume of deliberate penetrating and blunt injuries are encountered. The aims of this study were to analyze the presentation, management and outcomes of all deliberate penetrating injuries that were attended by the surgical-led trauma team at our hospital between 2006 and 2008. A retrospective review of collected data from the Hospital database was conducted. The database contains comprehensive medical records for all patients attended by the trauma team for deliberate stab injuries. It is updated by the surgical team after each admission. All patients with deliberate penetrating injury who were attended by the service between 1 January 2006 and 31 December 2008 were identified. Patients who died in the prehospital phase, those managed exclusively by the emergency department and limb injuries without vascular compromise were excluded from the study. The primary outcome measure was the number of cases of deliberate penetrating trauma attended by trauma service at our hospital based in North London over the study period. The mortality rate was also recorded. Statistical analysis was performed, using 'Stats Direct' and the significance level was set at P<0.05. Paired Student 't'-test was used throughout. We also recorded the site of the trauma, the timing of presentation, the population affected and management of these patients. In total, there were 619 total stabbings between 2006 and 2008. Two were cases of self-inflicted knife injuries. In general, there has been a steady annual reduction in the number of stabbings taken place between 2006 and 2008 [Figure 1]. There were 234 cases (37.8%) in 2006, 215 cases (34.7%) in 2007 and 170 cases in 2008 (27.5%). The difference in number of stabbings between 2006 and 2007 was not significant (P=0.18) but was significant between 2007 and 2008 (P=0.04). There were a total of 137 surgical admissions for stab injuries in the 3 years (approximately 22.1%) although no obvious trend was observed during the 3-year time period. Unsurprisingly, the number of stabbings was far greater in the male compared to the female population [Figure 2]. This was statistically significant for all 3 years during our study (P<0.05). Ninety-seven percent of surgically admitted victims were male (133/137). In 2006, 98% of surgically admitted patients were male whilst 95% were male in 2007. In 2008, there was no female stabbings and all admitted cases were male (100%). In general, 94% of stabbing victims who required surgical admission presented to our center between 6 pm and 6 am [Figure 3]. We also noted that 74% of stabbing victims who required surgical admission presented to our center over the weekend [Figure 4]. In 2006, 98% (49/50) and 94% (47/50) of stabbings whom required admission presented between 6 pm and 6 am and during the weekend, respectively [Figure 3] and [Figure 4]. There was a gradual decline in these figures in the next 2 years. In 2007, 91% (56/61) and 64% (39/61) of stabbings whom required admission presented between 6 pm and 6 am and during the weekend, respectively [Figure 3] and [Figure 4]. 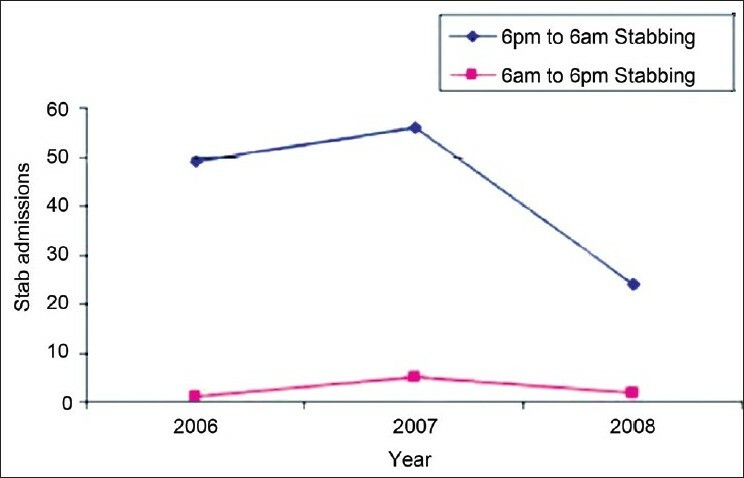 In 2008, 92% (24/26) of admitted victims presented between 6 pm and 6 am while 58% (15/26) of stabbing victims were admitted over the weekend [Figure 3] and [Figure 4]. The data was statistically significant for all 3 years when comparing 6 pm to 6 am stabbings compared to 6 am and 6 pm stabbings (P<0.05). When comparing weekend and weekday stabbings, the statistical significance was present in 2006 (P<0.05). It was also significant in 2007 (P<0.05). 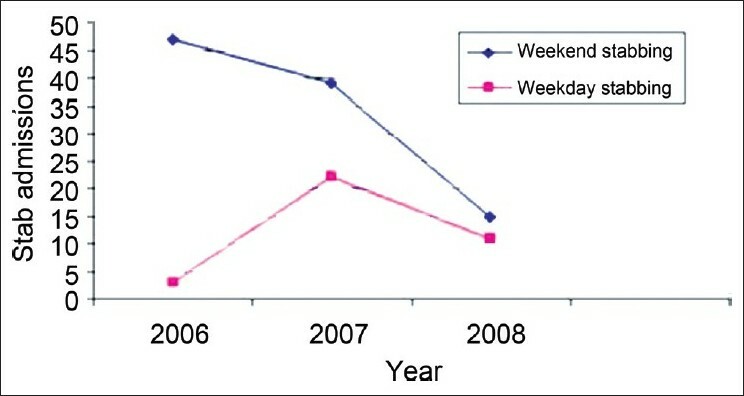 However, there was no significant difference observed in the number of admission presenting on weekends or weekdays in 2008 (P=0.38). The youngest victim involved was 13-years old (in 2007) and the oldest victim involved was 53-years old (in 2008). Of the surgical admission, 32% were below 20 years of age and 40% of victims were between 21 and 30 years of age. In 2006, 22% of victims were below the age group of 20 years and 54% of victims were between 21 and 30 years of age. In 2007, 33% of victims were below 20 years of age and 40% of victims were between 21 and 30 years of age. In 2008, 50% of victims were below 20 years of age and 15% of victims were between 21 and 30 years of age. [Figure 5] shows the overall age distribution of stab victims over the 3 years. The most common site of stab in patients who required admission was chest followed by abdomen and neck. This was a consistent finding throughout the 3-year period. In victims with multiple anatomic areas of stabbing, chest was always involved. In total, 83 out of 137 (60.7%) admitted patients sustained chest stabbing whilst 45/137 (32.6%) sustained abdominal stabbing. 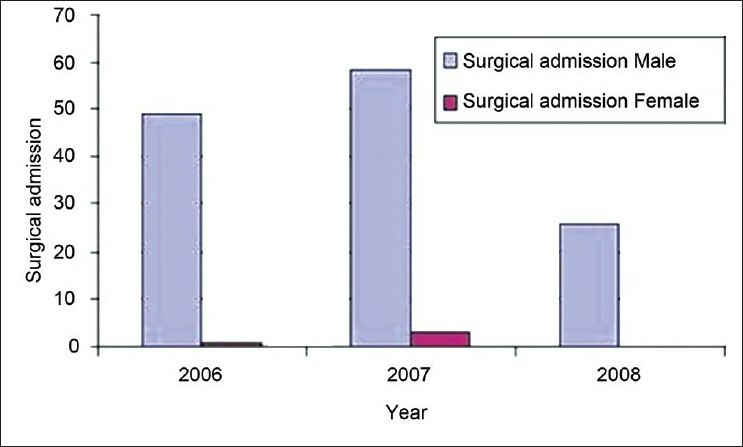 [Figure 6] shows the anatomical distribution of stab victims over the 3-year period. 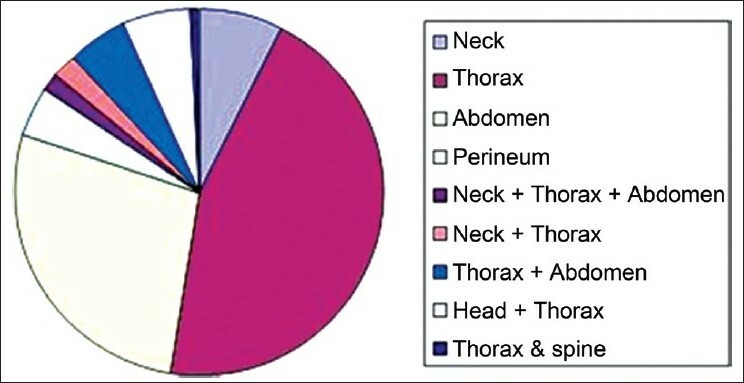 In 2006, 50% (13/26) of admitted thoracic stabs required tube thoracostomy. Whereas this was 18% (7/39) in 2007 and 24% (4/16) in 2008. In 2006, only two of the admitted thoracic stab victims (8.0%) had thoracotomy, and eight out 21 admitted abdominal stab victims (38.0%) underwent laparotomy. In 2007 only 2.4% of admitted thoracic stab victims had thoracotomy (1/41) and 5.6% of admitted abdominal stab victims underwent laparotomy (1/18). In 2008, only 6.3% of admitted thoracic stab victims had thoracotomy (1/16) and three out of seven admitted abdominal stab victims underwent laparotomy (42.9%). In terms of vascular injuries, there were three major vessel injuries involving the Inferior Vena Cava (IVC) and Internal Jagular Vein (IJV) in 2006 while one patient had popliteal injury in 2008. All vascular injuries required surgical intervention. In general, the majority of patients admitted were treated conservatively. In 2006, 26 out of 50 patients (52%) needed a surgical procedure (thoracostomy, thoracotomy, laparotomy, vascular repair). In 2007, 14.8% needed surgical intervention (nine out of 61 patients) while 34.6% had surgical management in 2008 for stab injuries (nine out of 26 patients). Overall, 44 out of the 619 patients attended by the trauma team over the 3-year study period required surgical intervention (7.1%). There were two cardiac injuries seen on thoracotomy. One cardiac injury was observed in 2006 while the other observed in 2008. Both were penetrating right ventricular injuries. All laparotomy cases performed in 2006 showed significant pathology (two liver injury, one stomach injury, one small bowel injury, one omental injury, one rectal injury and two diaphragmatic injuries). In 2007, no significant injury was observed on the single laparotomy. In 2008, two out of the three patients (67%) patients undergoing laparotomy were found to have significant injury and this was found to exclusively involve the stomach. Overall, there were two (16.7%) negative laparotomies out of the 13 cases performed in the 3-year study period (in 2006 and 2008). Only one patient in our study had a diagnostic laparoscopy in 2008 which was then subsequently converted to a laparotomy. In total, there were five deaths (0.8%) due to stabbing between 2006 and 2008 in the overall study population. All these patients presented with multiple stabbings and failed to respond to resuscitation on arrival to the hospital. There were no operative mortality observed. Our institute is a district general hospital in inner-city North London, supporting a population of over 100 000. Many of these patients are of varying ethnic origins such as Turkish-Cypriot and Afro-Caribbean descent. Our data demonstrated an annual decrease in the amount of deliberate penetrating trauma attended by a surgical-led trauma service over a 3-year study period. This is very surprising considering that the number of penetrating injuries is believed to be rising according to media speculation. A recent in-hospital study conducted at the Royal London Hospital recorded an increase in the amount of penetrating trauma managed by the emergency department from 2004 to 2006. In addition, a recent retrospective study conducted by Crewdson et al.,  showed a consistent annual increase over a 16-year study period at a "physician-led trauma service" in The Royal London Hospital. It is probable that figures obtained for London are not representative of the UK as a whole. Higher rates of penetrating crime in the inner London area may be related to lower socioeconomic factors, higher social tensions between ethnic groups and greater levels of organized crime. There are three other features seen in this study. The first is the large percentage of male middle-aged victims involved in stab injuries; the second is the anatomical site of injury with predominant number of stab injuries to the thorax and finally the majority of stab victims presenting out-of-hours. These trends are not surprising and have been widely reported in the literature. In most studies for penetrating injuries, the typical patient was a young middle-aged man accounting for 90% of affected victims. , It is widely accepted the majority of stabbing occurs in public places like streets and pubs. Hutchison et al. in 1998 reported that the commonest sites for assaults were the street, followed by public drinking establishments. Drinking alcohol has been identified as one of the most pressing problems, as it invariably results in underlying tensions to break out into violence and assault. This accounted for why most of our patients presented between 6 pm and 6 am when patients are most likely to be under the influence of alcohol. It is also why many of the stab victims presented at the weekend. Recently in November 2005, there has been relaxation of alcohol laws in the UK (Licensing Act 2003) allowing drinking beyond the previously 11 pm cut-off period and during the week. These laws were aimed at reducing the overconsumption of alcohol in defined time periods and thereby reduce violence. The changes in the drinking laws probably accounts for why there has been a gradual shift in the days when penetrating injuries occur. Our results showed a gradual movement of stab injuries from weekends to any day of the week. In addition, these drinking laws were proposed to reduce the brawling and antisocial behavior encountered as a result of crowds of people leaving pubs and clubs at the same time. This could be one explanation for the gradual decline in the overall rate of penetrating injury between 2006 and 2008. This was also experienced in a recent study done at University College London Hospital where rates of maxillofacial injuries secondary to alcohol use have fallen by 34% since the Licensing Act were introduced. Their study did, however, show an increased number of attendances over the weekend in 2005/6. Conversely, study done by Newton et al.,  showed an increase while Graham et al.,  showed no changes in the rates of attendances to the emergency department after the implementation of 24-hour drinking laws. Although the introduction of Licensing Act may account for the reduced presentation of stab injuries, there are other potential reasons - political, social and economic - which could also explain these trends. Unemployment has been shown to be an important variable in predicting violent activity  and so reduced levels of unemployment within London during the observed period could have played a part in reducing rates of penetrating injuries. Heightened Law enforcement and security practices, including closed circuit camera use and direct police presence especially at public gatherings, may also have contributed to our findings. It is a possibility that the developing Trauma System in London, in the last few years, may have had an impact on diverting specific injuries to more Trauma-oriented hospitals. Also, patients who were killed outright before arriving to hospital was not included in the analysis. These factors could skew the results and cause a false sense that there is a drop in the number of stab wounds over the years in London. This is one of the limitations of our study. Unless one can show on a population-based registry that there is a true reduction of stab wounds, one cannot be sure that there is a real drop in numbers. The timing of the stabbing raises a very important question. Most of the stabbings were encountered during the on-call hours when staff numbers are limited to the on-call surgical team. This problem is well recognized. However, the advent of European Working Time Directive (EWTD) has increased the potential to overwhelm the trauma service further and compromise critically ill stab victims needing urgent management. Clearly, trauma service needs to be utilized in such a way that there are staff available to meet the high demand out-of-hours. It may mean that consultant trauma surgeons and emergency physicians are present on site and actively involved at these crucial hours to deal with stab victims. The development of effective ambulance triage systems to facilitate the transfer of patients to specialized trauma centers may have helped reduce this burden on district general hospitals. The majority of our patients presented with thoracic stabbings. Our center is adequately located with at least three major cardiothoracic referral centers only 30 minutes away. Despite this, only four patients required a thoracotomy during the 3-year study period. 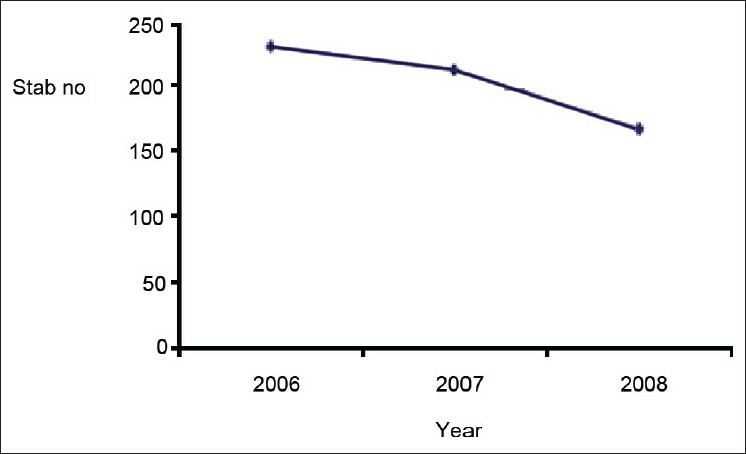 There was also a general reduction in the number of patients who had tube thoracostomy in the study period from 50% in 2006 to 18% and 24% in 2007 and 2008, respectively. There has been no change in our protocols that could account for the reduced number of chest victims needing intervention at our institution. It is plausible that our hospital is encountering less severe chest injuries as a result of effective ambulance triage system that ensures that critical stab victims are diverted to these specialised centers. The majority of patients that presented to our center were likely to have sustained minor chest injuries that can be treated conservatively. There were several limitations with our study. It would have been most valuable to include patterns of intoxication with alcohol and other substances among the patients who were treated. Determining the patterns of intoxication and drug use within the perpetrators would also be useful but is clearly not practical. As mentioned earlier, our findings only reflect the trends observed in one busy district general hospitals. A population-based or multi-center study would give a more accurate reflection on the rate of penetrating injuries observed in London as a whole. It would also have been more useful to include the injury severity score for our patients to evaluate the need for surgical management. Over the 3-year period the percentage of victims below 20 years of age per year is increasing (21%, 33%, 50% in 2006, 2007, 2008, respectively), with more fatal injuries. There is a decline in victims in 21-30 year age group in 2008. Ninety-three percent of knife crimes occur between 6 pm and 6 am, recently moving toward week days from weekend period. Several factors may account for these changing trends. This includes the implementation of the Licensing Act. Despite this, there needs to be a shift in the utility of the trauma service so that demands are served adequately when it is needed most out-of hours. The development of effective ambulance dispatch systems and dedicated trauma centers is clearly one of the first steps toward solving this complicated dilemma. 1. Maxwell R, Trotter C, Verne J, Brown P, Gunnell D. Trends in admissions to hospital involving an assault using a knife or other sharp instrument, England, 1997-2005. J Public Health (Oxf) 2007;29:186-90. 2. Kessel B, Peleg K, Hershekovitz Y, Khashan T, Givon A, Ashkenazi I, et al. Abdominal stab wounds in Israel, 1997-2004: Significant increase in overall incidence and prevalence of severe injury. Isr Med Assoc J 2008;10:135-7. 3. Lemard G, Hemenway D. Violence in Jamaica: An analysis of homicides 1998-2002. Inj Prev 2006;12:15-8. 4. Meel BL. Homicide trends in the Mthatha area between 1993 and 2005. S Afr Med J 2008;98:477-80. 5. Gruen RL. Injury in indigenous communities: A call for enlightened action. ANZ J Surg 2007;77:930-1. 6. Rozen WM, Ma EH, Jones IT, Judson RT. Emerging epidemic in Australia: Abdominal stab wounds. Twenty-four months at a major trauma centre. Emerg Med Australas 2007;19:262-8. 7. Eades C. 'Knife Crime': Ineffective reactions to a distracting problem? A review of evidence and policy. 1 st ed. London: The Centre for Crime and Justice Studies; 2006. 8. The 2001 Census Borough and Ward Profiles. London Borough Of Haringey. 2001 Available from: http://www.haringey.gov.uk/index/news_and_events/fact_file/statistics/census_statistics/ethnic_group_theme_tables.htm [Last cited on 2009 Jul]. 9. Konig T, Knowles CH, West A, Wilson A, Cross F. Stabbing: Data support public perception. BMJ 2006;333:652. 10. Crewdson K, Lockey D, Weaver A, Davies GE. Is the prevalence of deliberate penetrating trauma increasing in London? Experiences of an urban pre-hospital trauma service. Injury 2009;40:560-3. 11. Jacob AO, Boseto F, Ollapallil J. Epidemic of stab injuries: An Alice Springs dilemma. ANZ J Surg 2007;77:621-5. 12. Hutchison IL, Magennis P, Shepherd JP, Brown AE. The BAOMS United Kingdom survey of facial injuries part 1: Aetiology and the association with alcohol consumption. British Association of Oral and Maxillofacial Surgeons. Br J Oral Maxillofac Surg 1998;36:3-13. 13. El-Maaytah M, Smith SF, Jerjes W, Upile T, Petrie A, Kalavrezos N, et al. The effect of the new "24 hour alcohol licensing law" on the incidence of facial trauma in London. Br J Oral Maxillofac Surg 2008;46:460-3. 14. Newton A, Sarker SJ, Pahal GS, van den Bergh E, Young C. Impact of the new UK licensing law on emergency hospital attendances: A cohort study. Emerg Med J 2007;24:532-4. 15. Graham CA, McLeod LS, Steedman DJ. Restricting extensions to permitted licensing hours does not influence the numbers of alcohol or assault related attendances at an inner city accident and emergency department. J Accid Emerg Med 1998;15:23-5. 16. Madan AK, Sapozhnik J, Tillou A, Raafat A, McSwain NE. Unemployment rates and trauma admissions. World J Surg 2007;31:1930-3. 17. Simon M. Reducing youth exposure to alcohol ads: Targeting public transit. J Urban Health 2008;85:506-16. 18. Inaba K, Demetriades D. The nonoperative management of penetrating abdominal trauma. Adv Surg 2007;41:51-62. 19. Navsaria PH, Berli JU, Edu S, Nicol AJ. Non-operative management of abdominal stab wounds - an analysis of 186 patients. S Afr J Surg 2007; 45:128-30, 132. 20. Isenhour JL, Marx J. Advances in abdominal trauma. Emerg Med Clin North Am 2007;25:713-33, ix. 21. Schmelzer TM, Mostafa G, Gunter OL Jr, Norton HJ, Sing RF. Evaluation of selective treatment of penetrating abdominal trauma. J Surg Educ 2008;65:340-5. 22. Saribeyoglu K, Pekmezci S, Baca B, Zengin K, Karatas A, Erenler Kilic I, et al. Laparoscopy offers diagnosis and treatment in abdominal stab injuries. Surg Laparosc Endosc Percutan Tech 2007;17:396-401. 23. Dapri G, Himpens J, Lipski D, Bruyns J, Capelluto E, Stevens E, et al. Role of laparoscopy in the management of visceral injuries following abdominal stab wounds. J Laparoendosc Adv Surg Tech A 2007;17:713-8. 24. Kaban GK, Novitsky YW, Perugini RA, Haveran L, Czerniach D, Kelly JJ, et al. Use of laparoscopy in evaluation and treatment of penetrating and blunt abdominal injuries. Surg Innov 2008;15:26-31. 25. Kopelman TR, O'Neill PJ, Macias LH, Cox JC, Matthews MR, Drachman DA. The utility of diagnostic laparoscopy in the evaluation of anterior abdominal stab wounds. Am J Surg 2008;196:871-7. Wilson, E. and Metcalfe, D. and Sugand, K. and Sujenthiran, A. and Jaiganesh, T.